Bunny is a Sea Otter canoe yawl designed and built by David Moss at his boatyard on Skippool Creek in Lancashire. David’s Sea Otter canoe yawls come in a range from 13 feet to 25 feet see David’s web site here). Most of the Sea Otter yawls are rigged with a lug sail; Bunny is unusual in that she is gunter rigged. Bunny was built in 1989. Her construction is of glued cedar strip with a mahogany veneer, which gives an excellent finish. David Moss carves a Sea Otter head on the tiller of all of his canoe yawls and Bunny is no exception. 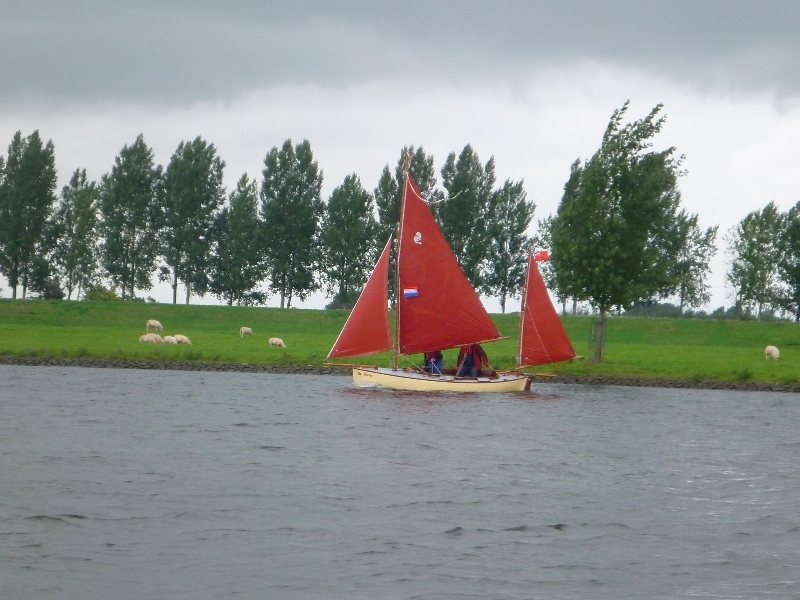 Being double-ended and yawl rigged Bunny is a safe boat in most conditions, but she is a light boat and so sails particularly well in light to medium winds often surprising larger boats with her speed. She also rows extremely well. Bunny has been well used and well traveled. With previous owners she has sailed extensively in Scotland, on the East Coast of England, the Thames Estuary and the Solent. She has also made trips to Morbihan, to Sweden and to Finland. We hope to keep up the tradition and take Bunny to as many new venues as possible. In 2013 we had a fantastic time attending raids in France (Le Semaine du Golfe) and Holland (Dorestad raid), on the Norfolk Broads (The English Raid) and Cardiff Bay (OGA).